What's It Like to Live in Phoenix? Phoenix, Arizona is a great place to live. It's a bustling city in the middle of the desert and, yes, it does get hot. Yet, that's a minor inconvenience when you can enjoy the outdoors year-round, right? Greater Phoenix has been and continues to be one of the hottest growth areas in the United States. But how do you know if it's right for you? What can you do to fit in? These are good questions, especially if you're moving from an entirely different part of the country. To much of the country, Phoenix seems like a far off wonderful world that doesn't see snow and cold. There are a number of things you should know about the city before you move. For instance, there are ​some things you just won't find here. Skyscrapers, historic landmarks, rusty cars, and potholes simply don't exist. What you will find in Phoenix is gardens of lush blooms, well-maintained highways, professional sports, and day trips to a great variety of places. There are a few quirks, though. Arizona is in its own time zone, for instance, and does not subscribe to daylight savings time, so that takes some getting used to. There is also an amazing array of acronyms you'll want to learn and, if you want to speak like a local, a vocabulary lesson is necessary. Whatever your reason for considering Phoenix as your new home, you probably have many questions about the finer details. These include housing, taxes, schools, and things you'll deal with in everyday life. You will find a great variety of home styles in the area. Most are single-family residences, though condos and townhouses are plentiful as well. There's also the patio home and Gemini or twin homes, which are unique. The majority do not have a basement, either. In your home search, you will also come across master-planned communities, which is common in much of the Southwest. Many people also have concerns over utility bills given the area's long and hot summers. There are a number of things you can do and consider when it comes keeping your electric bill low. Plus, the Arizona property tax is confusing, so you'll surely want to understand that before making an offer. Taxes, in general, might be a little different. It's not a bad idea to brush up on the details of all taxes at the same time. The Phoenix metro area is very expansive. It's not a walking city by any means, so you will want to think carefully about where you want to live. There are nice places and some you will want to avoid, but they tend to be intermingled no matter which part of the area you're in. The commute is likely to be a big factor for many new residents. It will, of course, depend on where you live and work, but we can give you a rough idea on rush hour commute times. The schools your kids will attend is another major factor in where you choose to live. Maricopa County has almost 1000 schools in various school districts, so it's best to do extensive research on the schools in the areas you're interested in. Job growth in the Greater Phoenix area has been robust for years. So will you find the job you are looking for? That really depends on what you do and how much they are willing to pay. What we can tell you is that there are many places online where you can browse job openings. You can also take a look at the occupations with the most available positions and the largest employers in the area. Keep in mind that Arizona is a Right to Work state and you'll want to refresh your memory on what that actually means. Of course, how much these jobs are paying in the area is an important factor. Depending on the skills and experience required, many are above the state's minimum wage. Living in one of the hottest deserts means that you need to be prepared for both the positive and negative aspects of the weather. Winters are wonderful, but summers are long and, to many people, oppressive. While it does rain in Phoenix, it's not much. Over a year, the area can get between four and eight inches, with the summer months producing the most rain. Because it's so dry, you will encounter dust storms and monsoons on occasion. These are both spectacular and frightening events. The good news is that when it does snow in the Phoenix area, people have fun with it. In fact, locals tend to remember the last time it snowed quite fondly and vividly. That's how rare it is. In order to live in the desert, you do have to adapt your ways. At times, it can seem trivial like choosing the color of your car based on how hot it can get inside. Other things are quite serious and there are many logical ways to survive the scorching desert heat. There are two important things that you must understand about the weather in Phoenix. First of all, you should know what they meant by the heat index. In this area, it's not humid so high temperatures don't feel as hot as they actually are. Second, it's critical that you know how to recognize heat exhaustion. When someone around you does have it, you also need to know what to do. The most important thing you can do in this climate is drink water, which can prevent many heat-related illnesses. And, by the way, it is not hot enough in Phoenix to fry an egg on the sidewalk. Every place has critters. Some areas of the U.S have to deal with alligators while others have sharks and creepy insects are everywhere. Greater Phoenix is located in the Sonoran Desert, which comes with a unique set of creatures. Dealing with the animals, reptiles, and birds requires a bit of education. For instance, it is very likely that you will come across scorpions. Scorpion stings are common and some can be deadly if you're allergic to them. It's very important that you know how to live around scorpions if you're going to move to the area. Other potentially harmful animals that you'll want to learn about are black widow spiders, snakes, and killer bees. Menaces like the Palo Verde Borer Beetle are harmless, but a mound of fire ants is not. One pest that's not native but can become an issue is the roof rat and you want to keep these out of your home. Yet, there are perks to the local wildlife. The variety of birds that enjoy the Sonoran Desert is great and they're interesting to watch. Likewise, you might spot the occasional Mexican fox, coyote, or bobcat. Lizards are very common, as are rabbits. The point is that it may be the desert, but there are some fascinating animals to be found here. Every large city has to manage natural resources and Greater Phoenix is no different. While we've already discussed weather and wildlife, there are a few more issues that you can expect from the local environment. First of all, Phoenix is in the desert and that means that water is an even more precious resource than it is in other areas. Drought is common and can last for years, but the residents of the area still need to use water. This makes water conservation more important than ever and it takes a team effort from everyone to make that happen. Big cities come with pollution, that is a fact of the modern world. Phoenix is a little unique in that its location in the desert and near mountains creates what is ​known as the "Brown Cloud." It's a serious air quality issue and you will find that Ozone Alert Days happen several times each year. Western wildfires get a lot of attention in the news and they can devastate wide areas of land. Arizona is not immune to the problem because the state includes six national forests. Even the grass and desert scrub lands can produce a fast-spreading fire. While a forest fire is not likely to reach Phoenix, one nearby can have an impact on the metro area. Many plants and flowers in the desert are different than in other parts of the country. This means that you will run into many new plants and that your approach to gardening may be different than you're used to. The Phoenix landscape is surprisingly green. People have grass lawns, plant flowers, and enjoy culinary gardens. The key is to understand which plants to grow and how to maintain them while conserving water at the same time. The desert is also a great place for spring wildflowers. Of course, you will find plenty of cacti around and in this climate, they get beautiful flowers. 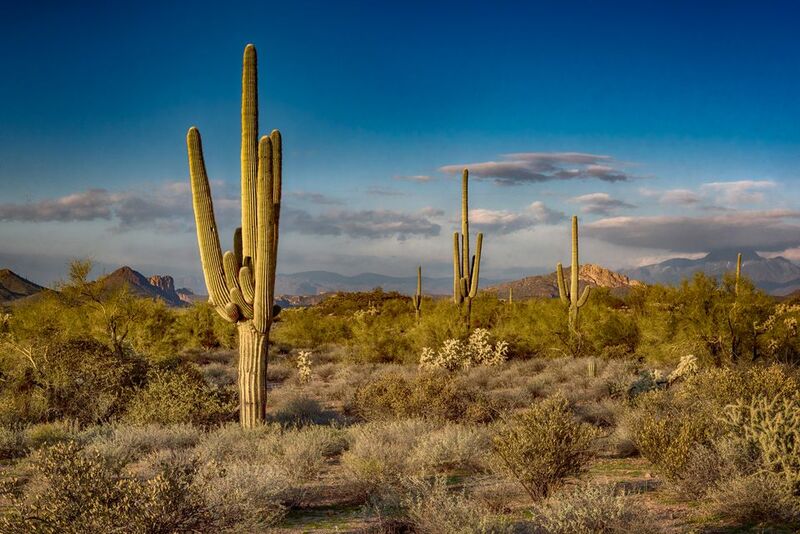 If you'd like to get a sense of the plant life of the area, a trip to the Desert Botanical Garden in Phoenix and the Boyce Thompson Arboretum in Superior will give you countless ideas. As you might expect, the tumbleweed is a common sight as well. It's not native, but it's plentiful and some creative people have found ways to use this wandering weed. Live in Arizona? It's Easy to Save Money!